Ultra HD 4K shark tank with an amazing selection of underwater life. Featuring various species of sharks. Plus manta rays and many more impressive fish. Available in 4K or Full HD as a video or screensaver. 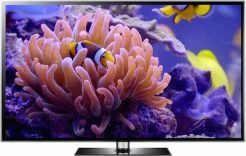 One of the very best 4K fish tank videos available and certainly one of the largest: ideal as moving TV wallpaper on big screen UHD SMART TV sets. The Ocean Tank is one of our most impressive 4K fish tank video screensavers. Watch it on a big UHD TV screen for the best effect. This fish tank is enormous and features amazing big fish like sharks and stingrays. It makes a stunning TV wallpaper aquarium. We have also down-scaled the footage to Full HD for anyone without a UHD TV set yet. This is also excellent quality with more detail squeezed in thanks to the higher filming resolution. This 4K fish tank video is also available as a screensaver, which self loops after 3 minutes. We have both Windows and Mac versions. 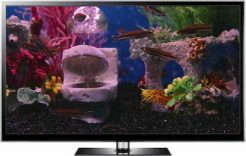 You can choose an Ultra HD 4k fish tank screensaver, or a Full HD version. Please note: not all computers and TVs are able to play 4K videos and screensavers. If you are unsure please clcik here to download our free samples. 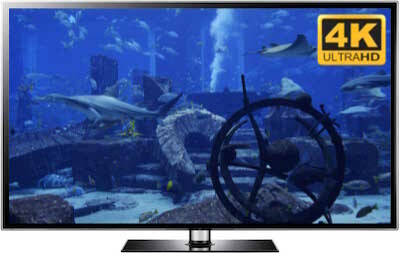 Once the shark tank video has begun playing please select 2160 4K from the gear icon to enjoy in the best Ultra HD quality, then click the Full Screen button to really experience this amazing shark tank in Ultra HD resolution. The Ocean Tank was filmed at a world famous aquarium with the most amazing features. The fish tank is like a real underwater seascape with ancient ruins which remind you of the lost city of Atlantis. There are shoals of lovely tropical fish and amazing sharks and manta rays. There are a number of different species of sharks. The manta rays seems to be flying through an underwater world. We have added a 5.1 surround sound audio track to make it really feel like you are under the ocean with amazing sea life. The bubbles at the rear help you feel like you are scuba diving in an underwater shark tank. The 4K Ultra HD version is absolutely perfect for even the very biggest TV screens and monitors. This shark infested 4K aquarium is encoded in the latest codec: HEVC H.265. This means the 4K video is a similar size to the Full HD video (which needs to stay in teh oild H.264 codec to work on old TVs). If you have any trouble getting our 4K videos to play just let us know and we will make the H.264 version available to you. The new codec keeps the crystal clear quality, even on the very largest UHD SMART TV screens- and that is where the sharks and manta rays in this tank look most impressive. A fantastic 4k screen saver for my LG Smart TV. Keep up the good work. Q I have a samsung uhd 55 inch TV will screen savers videos work. Q How do I get this on to my tv as a screensaver? A Hi Kevin, I am actually using The Ocean Tank across my 3 monitors at the moment, wish I could attach a photo here. Anyway, yes you can use the Windows and Mac screensavers across 3 monitors. The same video can be played on each one, or you can choose which ones show it. The video is not spread out across monitors, it is mirrored on each monitor. Don't buy the MP4 versions for this because you would need to use 3 separate media players to do it and they would be out of sync.